The whole idea of living debt free really does sound nice. Yet, there is a troubling question that comes up. Is a person's value to the society in which they live understood in proportion to the debt they owe? A system, perhaps a jealous system, would despise those who refuse to buy into it through the accumulation of outstanding liabilities. The debt-free individual may be much less manageable. "Is that all I get? Hey, you should be happy. 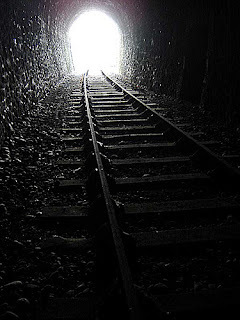 There's a light at the end of the tunnel!" "Look, your advice has been really crucial. For that I am thankful. Yet, I'm not about to start celebrating until this thing is actually over." 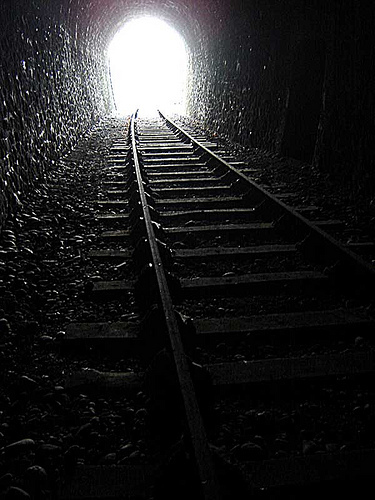 "Really, I can assure you that light at the end of the tunnel is the real thing... it's is not a train." "Thank you... I'll continue walking along the side of the tracks just out of habit. Besides, once I'm out, the initial glare could be blinding." Do it! Fight the man. At this point, just have to hang on. A few more steps. Almost there.